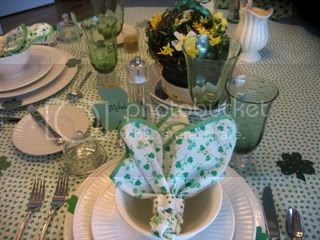 Failte (welcome) to Tablescape Thursday! This week, next and of course on the 17th, the theme will be GREEN! 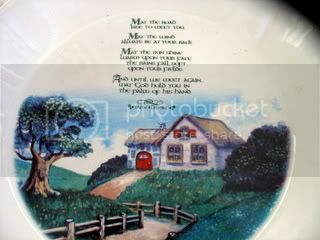 Tonight I used white dishes, Clermont, the cup and the bowl have a little foot on them that I like...and they are inexpensive.. 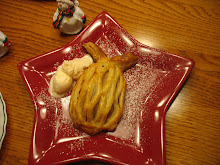 The centerpiece is from Christmas Tree Shops..
Press a puff pastry dough into a tart pan.. Arrange the pears,brush with preserves, I used apricot.. 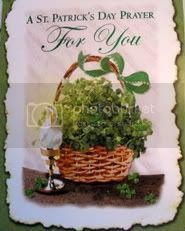 Thank you for coming, and don't forget, you are all invited to the St.Patrick's Day Party on the 17th..
Kathleen, I like this post... nice and cheerful! Looking forward to your party. Nice tart! Ken has seen my "green" package that will go into the car to take tomorrow morning on our vacation in Florida :) Just a few festive goodies to liven up our rental condo! I'm not a blogger but I'll send you a photo, Kathleen. 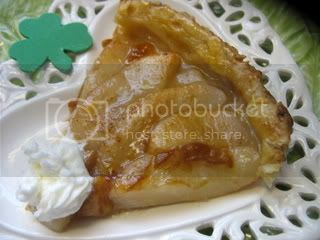 I'm thinking that pear tart would be easy enough even for me and we'll be having a bit of company down there and I already have those little green shamrocks to decorate it with - thanks for the easy recipe Kathleen! I'm not much of a desserter and I never know what to make for company and I always want it to be easy! Your pear tart look fabulous! 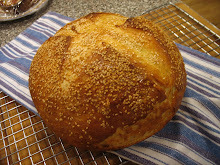 I wish I could have a bite right now! 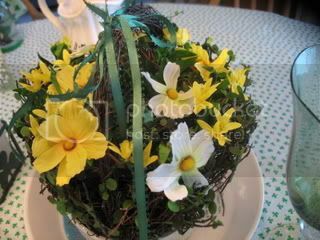 I love your shamrock header and of course your green theme tablescape. Very lovely,indeed. Now, that's an inviting tablescape. 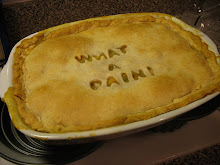 I really want a piece of that juicy apple pie! Well done. Kathleen - love the linens!! 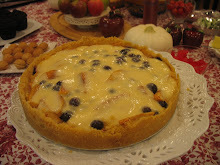 Personally, I like the white dinnerware, you can do so much with them..and the pear tart is yummy..send me a piece!! 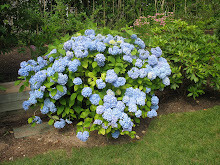 Lovely pure white china -- so crisp and fresh looking next to the green. 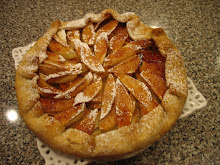 And that pear tart... ummm... that's a must-make! 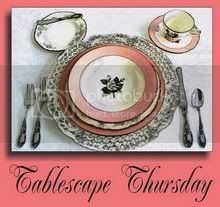 Love your table~such pretty dishes too! Oh, the pear tart looks divine. OMG, that pastry tart is making me drool on my keyboard! Getting us all in the mood for St. Patrick's Day for sure! 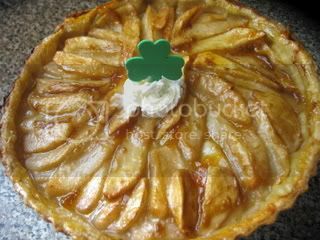 The pear tart looks wonderful and so festive with it's little shamrock topper. Looking forward to seeing your table next week and on the 17th as well! Very sweet...the tart looks so delicious...and the shamrock wreath is darling. 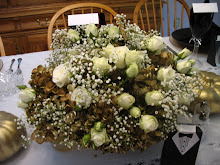 Beautiful centerpiece and napkins. 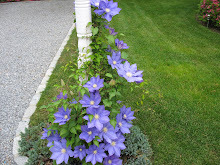 ...I love green .... it's refreshing and invigorating. The O'Pear tart is very pretty. .. It glistens. Your green and white table is very cheery, Kathleen! I'd love a piece of that pear tart - it looks so good! This is so lovely. Everything looks so festive and Irish! 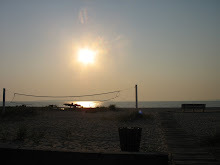 Looking forward to seeing what you have for us next week, too. 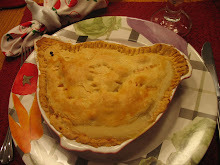 Pass the pear pie please!! !It's all beautiful but one I hit that pie I forgot all the rest. :-) Okay..I know it's a pear but I couldn't resist the alliteration! 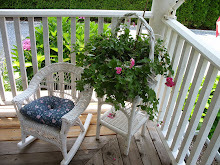 Kathleen, love your green and white theme. The pear tart isn't bad, either! What a precious tablescape. 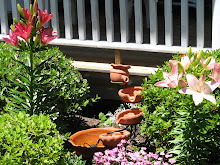 So fun to go visit all the Tablescape participants and get ideas. Yours is amazing. 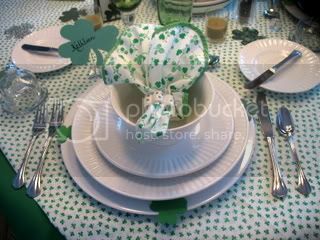 I love the shamrock napkins...so cute and the little plate just darling! Your pear tart sound fab! I made a pear tart last week but I'm pretty sure I'd like your recipe better! Pear tart looks wonderful, and the table looks great! I am loving your lead up to St Patrick's Day! Every tablescape you do looks great! 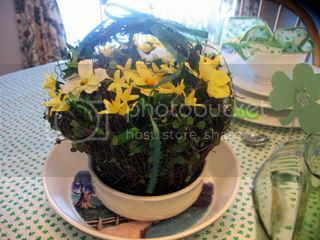 Kathleen, I love all your tablescapes, but this one has certainly put me in the mood for our St. Patrick's day celebration. The pear tart is a work of art! I have no artistic talent/creativity with table scapes. I'll have to lurk, here, and try to learn by example. I LOVE your pear tart recipe. Very easy, and I have puff pastry in my freezer. Thank you! This is so beautiful and festive, I love it!